It will be my third symposium. I loved demonstrating in Singapore in 2015, then teaching about colour in Manchester in 2016. The workshop schedule for Chicago is here (http://www.urbansketchers.org/p/usk-symposium-programming.html) Choose your workshops and demonstrations before you register. Registration is from the 11th February - get all set up in advance as it can be very busy on the day. I'll be teaching a workshop called Drawing Out the Details. 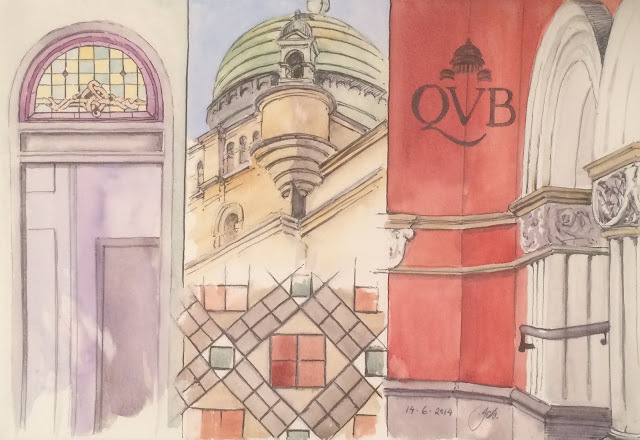 I often like to draw small sections of a scene rather than the whole view, like this series of sections of the QVB in Sydney. It's a way to tell more about a place than you can in a single view. 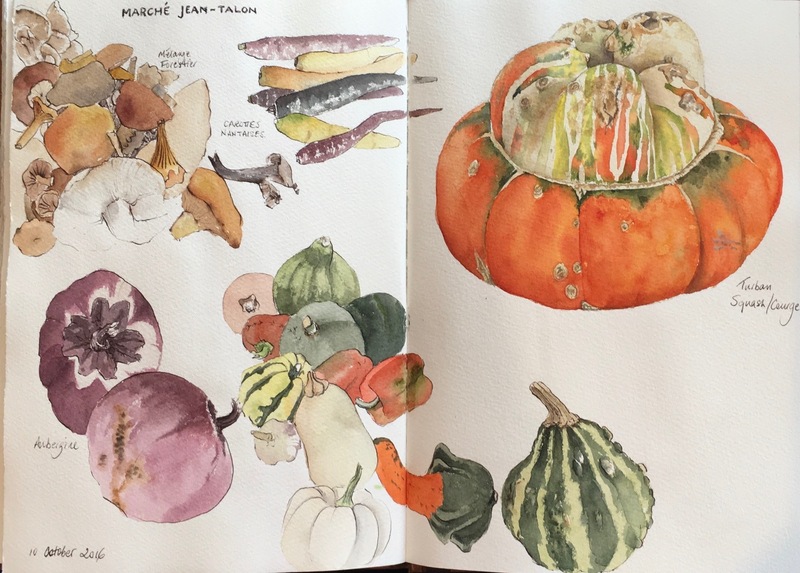 This is a series of sketches from a market in Montreal. 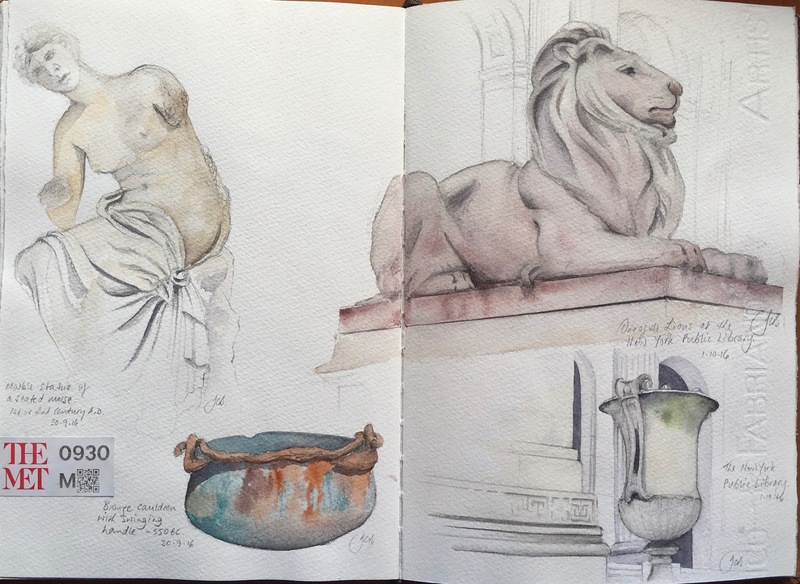 And this series of sketches are in New York - in the Met and outside the Public Library. I choose materials to sketch with that will be most suitable for the subject - sometimes a water-soluble pencil to show a softer subject, sometimes a pen, sometimes black ink, sometimes grey or brown. During the workshop I'll be sharing sketching tips and techniques while exploring a range of sketching tools to build a montage of a scene by drawing the details. Here's a sketch of some of my favourite sketching tools. I'll have a number with me for participants to try - it's always best to try things out before you buy them and add them to your kit :-) For full information about all these tools see my in blog post. Hi Jane, I've been checking out your favourite sketching tools and I noticed that you recommend (as well as many other watercolourists) De Atramentis document ink as being waterproof. I recently bought some to put in a Lamy Joy with a fine nib. Unfortunately, it is not waterproof and bled quite noticeably producing a blue smear. This is really disappointing as it cost me almost $30AU. I'm interested to know if you've heard of this happening to anyone or do I have a dud on my hands? I have contacted the seller. Thanks for your help. Kaz I am very surprised - are you sure you received the 'Document' ink? There are hundreds of regular De Atramentis inks that are not waterproof, and only about a dozen that are labelled Document. In my experience they have been totally waterproof once dry, which takes very little time at all. If you were sent a normal DA ink then certainly it would run. Another question - did you completely clean out the pen first and flush with water to make sure any other ink was not still in it? then fill it with the document and draw for a while to get the full ink flowing. If it is labelled Document, put in a clean pen and still runs, try it on a different paper. Then if it still runs contact the seller and have it replaced. Thanks for your reply Jane. The problem was residual Lamy turquoise ink. I thought that I had completely flushed out the Lamy Joy but obviously not too well! The bottle is definitely labelled Document ink. I've put it in a new, unused pen and drawn with it and waited for it to dry. The result is much better. Thank you so much for your help Jane. Have fun in Chicago!!! Good to know Kaz. I love drawing with fountain pens and those Documents inks have been a revolution. Enjoy your :-) ...and remember you can make a gorgeous grey if you mix the blue with the brown...which is also lovely to draw with alone! Getting organised - are you a paper diary person?